Big and bright with a rosy blush on the outside, Ruby Reds have juicy, sunset red fruit inside. 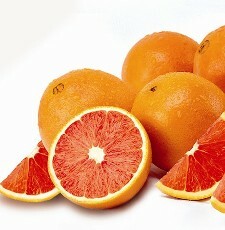 So sweet - no need to sprinkle any extra sugar on our Ruby Red Grapefruit. 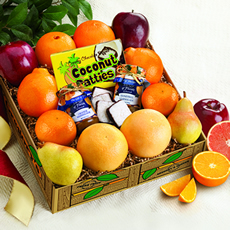 Guaranteed to arrive grove fresh and ready to enjoy. How Many Trays should I order? 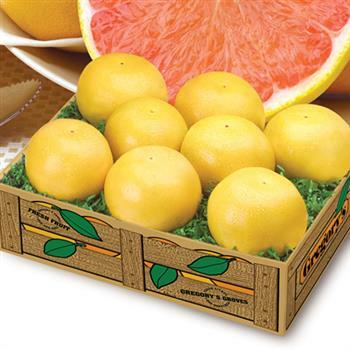 Grapefruits arrived on time but two were in very poor condition. The grapefruits were good but small. This is the second time I have had fruit delivered fruit delivered and both times I had soft spots on the fruit. The first time I called and they did replace my order for free. Also, my fruit arrived later than Iexpected by about 5 days. I'll choose someone else the next time. The fruit has been fresh and delicious when delivered.If there is one thing that bothers me is that my credit card is charged way in advance of the order being sent. This years shipment that we ordered was not as juicy as in some years past. I realize weather plays a big part in that way. But the grapefruit was exactly the sweet/tart kind we like. Thanks. I'll probably be ordering again next year. Most of the grapefruit was delicious. There was 4 rotten grapefruit that had to be thrown out,and a few of the grapefruit had very thick skins with very little fruit on the inside. I would say that the bad grapefruit amounted to about 7. The rest were very, very good. they were small but very juicy, with nice consistency of the meat of it. Even though we had 2 bad pieces, these were very sweet and delicious. 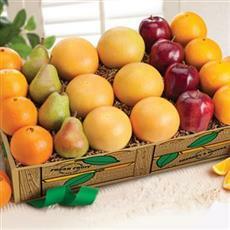 My sister stated all the fruit was in excellent condition and great tasting. Parties welcomed this gift and said it was great. Will use again in the future! only 2 were bruised on shipment. The rest of them are delicious, still working on them. I love Gregory's grapefruit! We have been gifted their fruit for about 10 years and I'm never disappointed!